We’re still under the weather around here so I didn’t get to work in my journal as much as I wanted this week. Everything seemed to take d-a-y-s instead of hours. I started these pages a few weeks ago but after I watched “Searching for Sugar Man” last weekend they came together for me. The quote I stamped on a piece of neutral cardstock and then I decided it wasn’t enough so I used some distress stains and white acrylic and washi to make it look a little more colorful. I stamped the quote on the front of the “flap” and then on inside I put in some journaling about the film and my reaction to it. 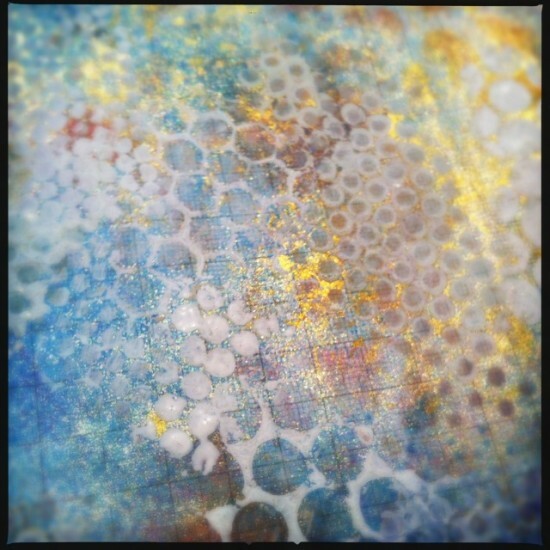 The cloud background is an old piece of Bazzill cardstock that I painted using some white acrylic paint and one of Julie Fei-Fan Balzers stencils. I layered the photo of the praying monk (which I clipped from a catalog) on some sheets of 6×6 cardstock and added some washi and a few clips. This page is just some random photos from February. I worked on it a bit over the week. 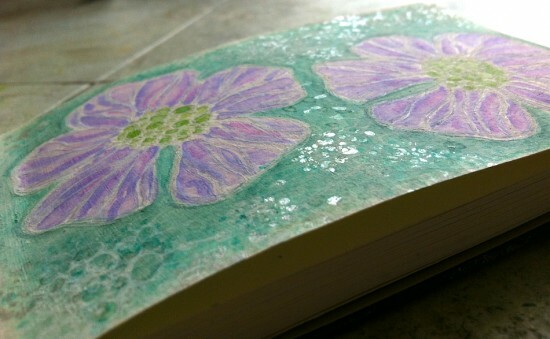 It’s just some paper from my last journal with spray inks and acrylic paints over it. In the middle is a bit that I cut out from a sheet of Glitz paper. I’m going to journal about all the photos and stuff on the next few pages I put into the journal. Not crazy about how this turned out. 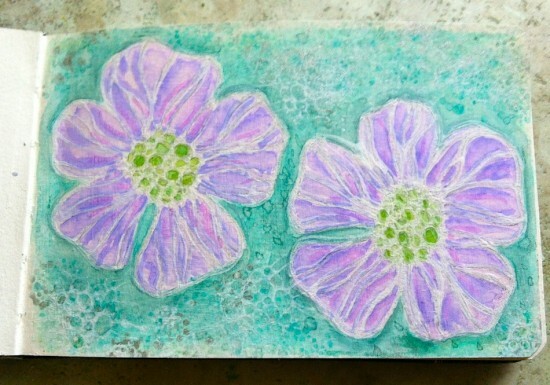 The two flowers are stamped- I originally stamped them in silver but as I painted them, the silver just blurred and turned to grey streaks so I tried stamping over it with white acrylic but, of course, it didn’t look crisp. Oh well, I finished it anyway. There’s actually a lot of texture on it. At least the colors are kinda spring-y, right? love how your quote looks on the top page with the added colors and washi tape Chel. 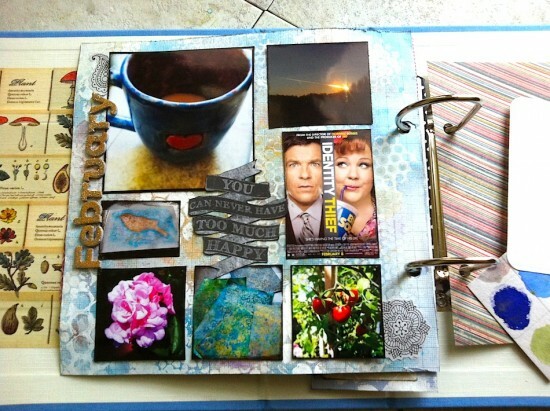 Your background page is beautifully layered, and I like your flower page! Love the little touches of gold! 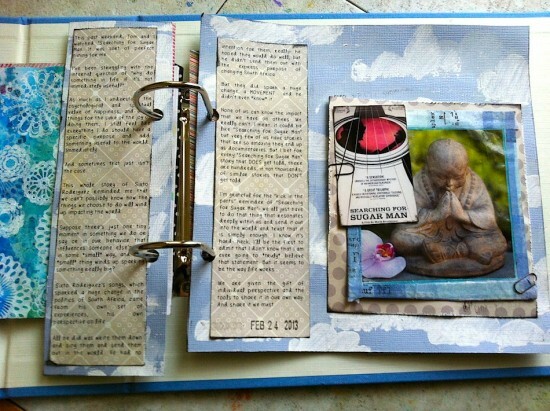 So pretty–as you know, your pages always inspire me! 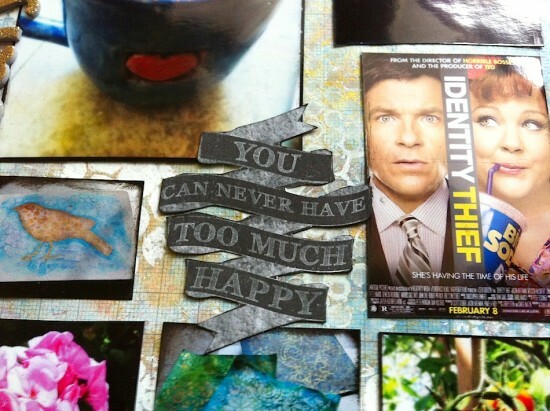 How did you like Identity Thief? I adore Melissa McCarthy, always makes me laugh–will she in this one too? Hope so! I really love how you put your pages into an album! 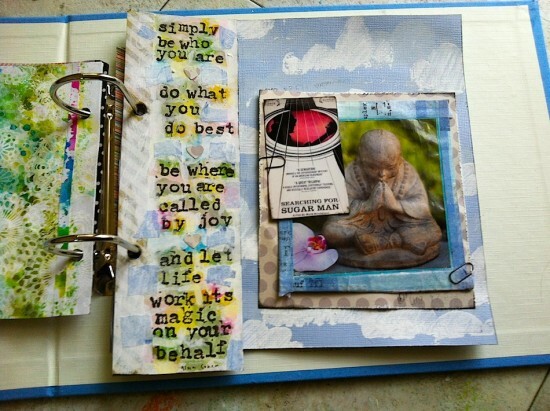 that is brilliant using them one page at a time rather than as I do, in a lumpy bumpy journal! lol I love all the textures and images (Identify Thief) in your pages. I’m so glad you showed your background. It is gorgeous!!! Happy PPF. Gorgeous is all that you create. Much love and many blessings. Love Jeanne I love your quotes and photographs and your creations. It’s always a treat to see your journal spreads. There’s so much to take in and I love the little bits of goodness that you add to get the full picture of your life in those moments. It was also great to see your little painting! You need to share more of your art!